Drag queens, mimosas and Indian food? Winter might still have it's cold hold over Chicago, but this brand new drag brunch is ready to turn up the heat!. 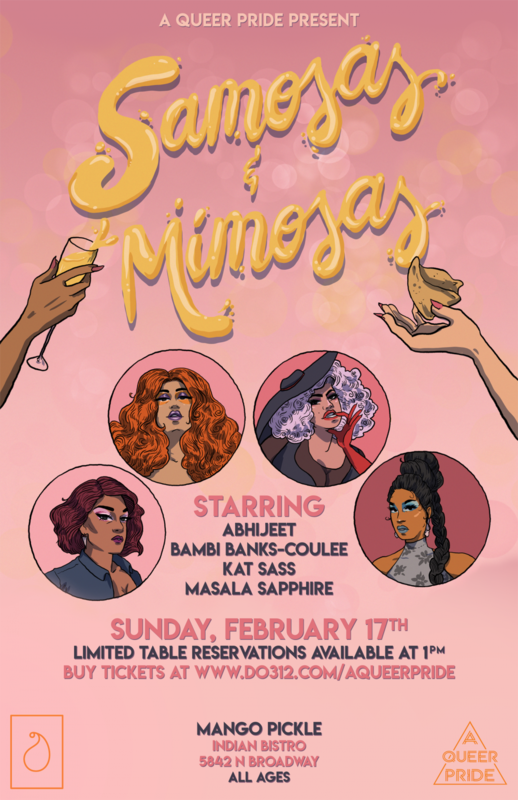 Join nightlife collective A Queer Pride (who bring you Big Gay brunch at Boiler Room every year) for a brand new LGBTQ dining experience - Samosas and Mimosas, on Sunday, February 17th at Mango Pickle (5842 N. Broadway) in Andersonville. Start your Sunday Funday with a pop-up drag show and two afternoon seating of Indian street snacks, high-chai delights and a hand-crafted menu of specialty cocktails influenced by India’s culinary landscape. $15 advance tickets include entry to the event, a plate of samosas and a mimosa.